In these days of carbon guilt, jet-setting is not as glamorous as it once seemed. And with the high price of fuel, not as cheap as it used to be. So how to sate your passion for the international whirl? 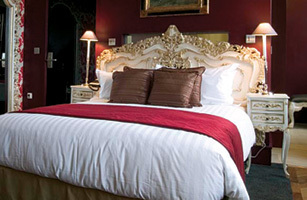 All it takes is a trip to Edinburgh, Scotland, and Le Monde (www.lemondehotel.co.uk), an 18-room luxury boutique hotel where every suite is decorated in the spirit of a different city. At Le Monde, guests can spend the night in Marrakech, a room that's all warm earth tones and furniture from North Africa; fall asleep in Rio under the gaze of Jesus (a picture of the city's mountain-top Christ the Redeemer statue takes up an entire wall); or order room service in a city that doesn't exist  Atlantis has a huge aqua-colored glass art wall and a tropical fish tank above the bed. Wherever you stay, every suite comes with wi-fi, a plasma TV and a mini-bar stocked with champagne and chocolate. While that makes it tempting to stay in your room, Paris, Milan, Vienna and Shanghai all beckon in the guise of an opulent brasserie, an elegant fashion café, a cozy bar and a nightclub that oozes decadence. At the end of the day, you can wind down with a CD of tunes from the city you're sleeping in and ponder the two weather forecasts slipped under your door  in my case, Barcelona: hot and sunny, and Scotland: rain. Sadly, it seems even fantasy travel has its limits.